At least it opens up the possibility of integrating Tasks into Google Docs now; when and if they finally make it possible for users to make their own apps for Docs. Personally, I still prefer Todo.ly, but Remember the Milk seems interesting. Thanks for posting the link! Отличным дополнением было бы и на Android. Ага? I've never used Todo.ly, but I highly recommend Remember The Milk. Great Google integration (built in Gmail app, great Android app) and natural language for adding tasks. It's a very Googly app, and I'm kind of suprised Google didn't just buy them during their acquisition spree last year. Google Tasks is already excellent. Integrates seamlessly with Google Calendar, Gmail and multiple Android apps. I never got the idea that they'd abandon it. Hope they don't as I use it all the time!!! Already "excellent"... what are you smoking? Thanks you! This will help the app I use for iPhone GeeTasks Pro. 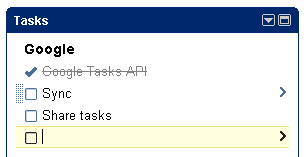 I lost hope with Tasks, particularly the lack of hierarchical lists. I've found GQueues has filled the gap much better than RTM. It's particularly well integrated for Google Apps users and now has a mobile version. problem with Google's google tasks is no notification. The best android app for Google tasks is GTO- Google Tasks Organized by Tinjasoft. Google tasks does not have the features I REQUIRE...repeating tasks, notifications, overdue reminders, etc. Google Tasks hasn't been updated or improved in years!!! I also want my task manager connected to my calendar and more, such as Outlook or Thunderbird's Lightning. After three years trying to get this to work with my Android phone...I DO NOT understand why it is so difficult. Keeping in Sync with Outlook is difficult and requires two or more special apps and accounts. And there is NOTHING for Lightning. What the hell??? Why are the hundreds of thousands of us that need our task managers from these "industry leading" software apps left cold for Android and others? My patience with Google and Android are gone. I just installed this Android app: Tasks N Todos - https://play.google.com/store/apps/details?id=com.handyapps.tasksntodos. Syncs with Google Tasks and adds also a lot of features for nomadic users. Good UI. Anyway, Google should take better care of it's Tasks service. It is mandatory for Google to come up with a stable, well defined Tasks API, so that this functionality becomes available in many applications (like Thunderbird). Lots of people I know remain in Outlook & Exchange world because in the Google world they can´t get the Calendar-Contacts-Tasks set.